- Today the French VIII and XXXI Corps advance against the southern face of the St.-Mihiel salient, advancing on the left flank of XII Corps. With this attack, covering almost the whole line from St.-Mihiel east to the Moselle River, the French hope to draw German reserves southwards as the main offensive is launched simultaneously against the western face of the salient. Here the French attacks are directed against the northern end of the salient, aiming to drive through the German lines towards the Woëvre plain, compelling the evacuation of the German positions to the south. A key objective is the hill of Les Éparges, from which the Germans can overlook the main French to the north towards the Woëvre plain. The morning sees heavy rain and poor visibility, which postpones the attack until conditions improve in the afternoon. After a preliminary artillery bombardment commencing at 11am, the infantry advance starting at 215pm. Everywhere the attack is a shambles, primarily due to inadequate artillery support. With insufficient time to plan the bombardment, many German positions have not been struck, while the rolling terrain has hindered artillery observers. Further, the soil, saturated from days of rain, absorbed numerous shells before they could detonate. Nowhere have the French secured any ground of significance. - Conrad writes to Falkenhayn today, reemphasizing yet again the difficult situation faced by the Austro-Hungarian army in the Carpathians. Further, Conrad argues, another reverse there would only encourage both Italy and Romania to enter the war, and that should this occur, Austria-Hungary would need to withdraw ten divisions from the Carpathians to meet this three (seven against Italy and three against Romania). He seeks assurances from Falkenhayn that these divisions will be replaced by German units should their withdrawal be necessary. - Unbeknownst to Conrad, Falkenhayn is considering his own arrangements: General Cramon, the German military attache at Austro-Hungarian army headquarters, inquires of Colonial Johann Straub, head of the Austro-Hungarian Railroad Office, of the rail situation in the Gorlice-Tarnow region. Straub informs Cramon that it would be possible to send one hundred trains into the area, each of one hundred and eight cars, of which forty would haul supplies and sixty available to carry soldiers. This suggests a German force of four corps could be deployed there in about eight days. - Meanwhile, in the Carpathians themselves, Austro-Hungarian fortunes are beginning to turn thanks to the arrive of German reinforcements. 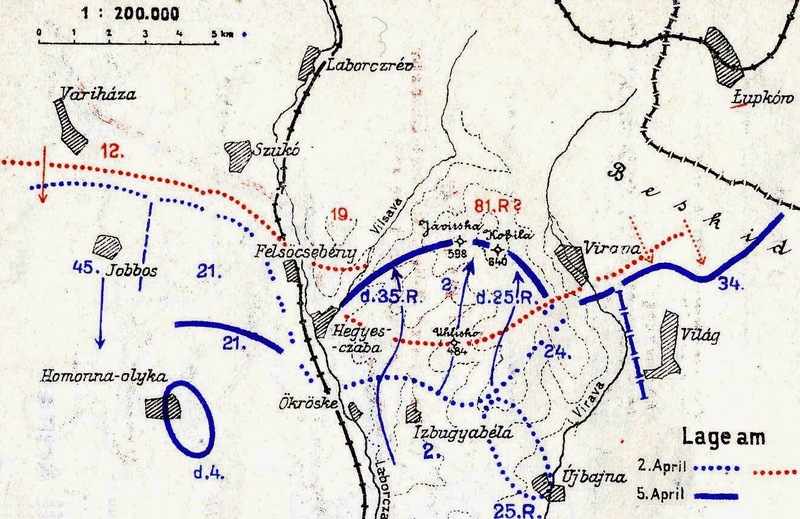 By this morning 25th and 35th Reserve Divisions of the German Beskid Corps are now in the line between Lupkow and the Laborczra valley, and launch a counterattack on the Russian lines, aided by the Austro-Hungarian 2nd Division. By late afternoon, they have advanced and seized the heights of Javirska and Kobila. The attack of the German Beskid Corps, Apr. 2nd to 5th, 1915. - Admiral Fisher once again writes to Churchill of his unease with the ongoing Dardanelles operation, which has only been heightened by the losses of March 18th: 'You are just simply eaten up with the Dardanelles and cannot think of anything else. Damn the Dardanelles! They will be our grave!' The fuse continues to burn . . .
- As British regular forces scattered throughout the Empire are called home in the first months of the war for service in France, the necessity arises for replacements for essential defense tasks. In some circumstances, the Colonial Office turns to the dominions for aid. Today, the first half of No. 6 Company, Royal Canadian Garrison Artillery, arrives at St. Lucia in the British Windward islands to man the half dozen artillery pieces defending the island.